There are several reasons why I volunteer with PSAR, and why you should, too, since this year’s 2019 theme for PSAR is “Salute to Service.” First, you may have heard the phrase that goes something like this: “You’re the sum of the people you hang around with,” or “You become who you surround yourself with.” I really believe it’s true. Other people’s thoughts and behaviors can certainly influence you. The people with whom you surround yourself can affect your bottom-line potential. We’re all affected by our environment, perhaps more than we think. When we surround ourselves with strong, high-achievers who have good character, then we are more likely to become just like them. On the other hand, a bunch of low-achievers can have a negative influence. If your best friends have a poor outlook on life and are satisfied with sub-par performance, then there’s a good chance some of that negativity will rub off on you. But, when you surround yourself with people who stand by high standards and strive to do better, then their motivation, dedication and energy are contagious and they will positively influence you. The people you spend time with will shape who you are. At PSAR, I have found a group of high-quality people who have outstanding leadership skills, bold expectations and high ethical and moral standards who strive for excellence. Their examples encourage me and motivate me. I want to be what they are. We all need friends who will help us succeed. This is especially true in real estate. Real friends can bring out the best in each other. They will encourage and motivate each other to reach goals. Also, friends who will cheer you on to success are a critical part of staying healthy. That’s what I find with my friends at PSAR. Even though we’re friendly competitors, PSAR members realize that we really need to be in this real estate sales business together and support each other. We all need to band together professionally. We’re better together. We all can experience greater benefits when we work together with a sense of community. There’s always something new to learn, which makes our industry existing. Plus, a high level of membership involvement helps to make our Association even better. That’s one of the main reasons why I serve on the PSAR board of directors. As a board member, I can have a role in going to bat for all of our members. Also, at the same time, serving on the board helps me grow professionally so I can become a better agent and better serve my clients. I am proud to say that PSAR fights for its members. In real estate, we need our Association to be on our side. PSAR is definitely on the side of agents and affiliates. Also, PSAR is on our side with legislative advocacy in support of bills that will help us in our practice and in opposition of job-killing and economy-killing potential legislation that will hurt us. Many agents may not be aware of PSAR’s advocacy efforts, but these efforts are very important to the survival of our industry, which is always under constant attack. Let me encourage you to become more involved and volunteer at PSAR so we can remain as one of the best Associations in the nation. Several years ago, I began with serving on a District Council. If you want your voice to be heard and want to contribute to PSAR’s decision-making process, then serve on a committee. Experience on committees is beneficial for those interested in seeking future leadership roles. Remember, that when you volunteer to participate with PSAR, you are contributing to our real estate industry. You also will be building valuable contacts and adding skills for your business success. Plus, you’ll become better informed, better networked and better prepared to act on trends impacting our industry. So, help set the course of your Association and make the decision to share you time, talent and expertise as a volunteer. You’ll be glad you did. 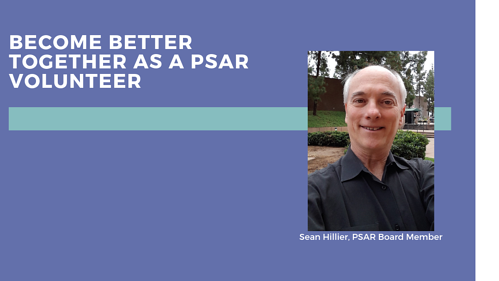 Sean Hillier has worked in real estate since 2010 began serving on the PSAR board of directors in 2019. He has served as emcee of the East County “Rally & Ride” marketing session on Thursday mornings since January 2015.